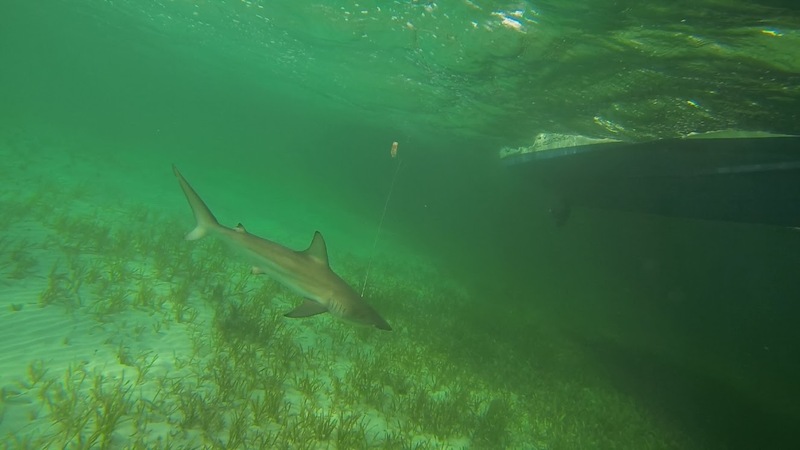 A new study led by scientists at the University of Miami (UM) Abess Center for Ecosystem Science and Policy and the Rosenstiel School of Marine and Atmospheric Science investigated how several species of coastal sharks respond to stress from catch-and-release fishing. The results revealed that each of the shark species responded differently. Hammerhead sharks were by far the most vulnerable to fighting on a fishing line. 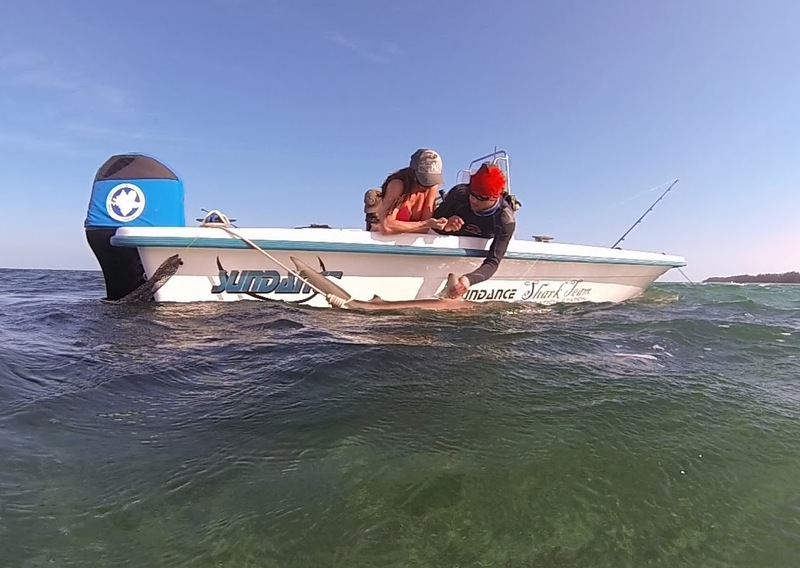 The UM scientists experimentally simulated catch-and-release fishing on five shark species – hammerhead, blacktip, bull, lemon and tiger sharks – in South Florida and Bahamian waters. Researchers took blood samples to examine stress, including pH, carbon dioxide and lactate levels, conducted reflex tests, as well as used satellite tags to look at their post-release survival. Fighting on a fishing line significantly affected the blood lactate levels of sharks, similar to what happens to humans during intense or exhaustive physical exercise, which has been linked to mortality in many species of fish. The study revealed that even with minimal degrees of fighting on a fishing line, hammerhead exhibited the highest levels of lactic acid build of all species studied, followed by blacktip, bull, lemon and tiger sharks. 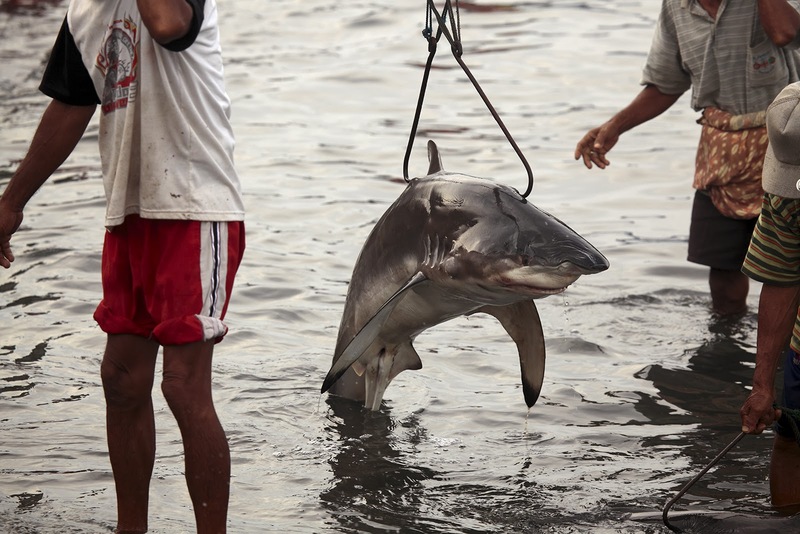 Tagging results also suggested that, after release, hammerheads were also prone to delayed mortality. "Our results show that while some species, like tiger sharks, can sustain and even recover from minimal catch and release fishing, other sharks, such as hammerheads are more sensitive" said lead author and Abess Center Ph.D candidate Austin Gallagher. "Our study also revealed that just because a shark swims away after it is released, doesn't mean that it will survive the encounter. This has serious conservation implications because those fragile species might need to be managed separately, especially if we are striving for sustainability in catch and release fishing and even in bycatch scenarios." Adds study co-author Dr. Neil Hammerschlag, a Research Assistant Professor at UM, "Many shark populations globally are declining due to overfishing. Shark anglers are some of the biggest advocates for shark conservation. Most have been making the switch from catch and kill to all catch and release. Our study helps concerned fisherman make informed decisions on which sharks make good candidates for catch and release fishing, and which do not, such as hammerheads. "AOV: This study has some policy implications, especially for hammerheads. How are hammerheads currently managed in South Florida and the Bahamas? Angelo O'Connor Villagomez had the chance to catch up with Austin Gallagher to ask some follow up questions about his new study and what the results could mean for fishermen. 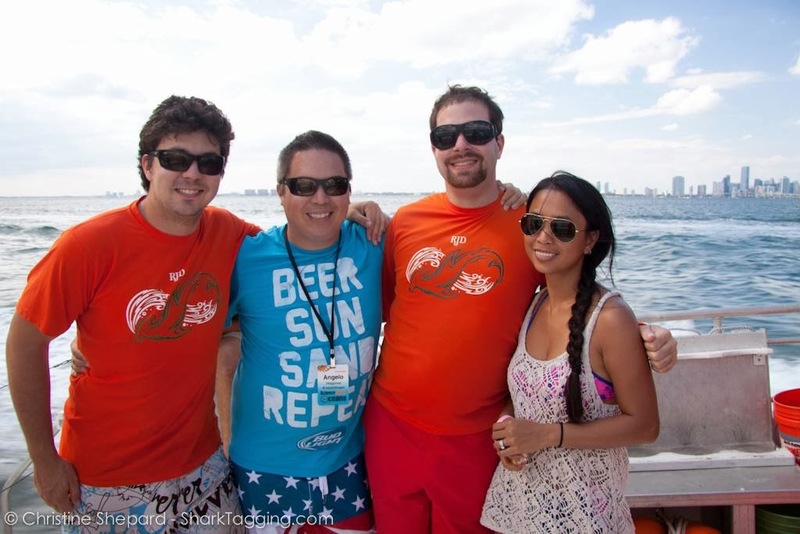 Austin Gallagher, Angelo O'Connor Villagomez, David Shiffman, and Eden Villagomez. AOV: This study has some policy implications, especially for hammerheads. How are hammerheads currently managed in South Florida and the Bahamas? AG: There are definitely some strong take-home messages that could help augment existing policy or even forge new initiatives. We found that hammerhead sharks respond poorly to fishery-related stressors, which is important data for managing them not only in Florida but in the greater Atlantic. In the Bahamas great hammerheads are protected from commercial harvest, and in Florida state waters they are a prohibited species. This means that if you are within state waters and catch a hammerhead (great, scalloped, or smooth, the first two of which have similar stress responses to fishing), it must be released. However our data show that these species are prone to higher mortality, which may undermine this policy measure even if they are released. Thus, I hope this data will be looked at carefully if we are striving for sustainable practices that are presumably designed to allow overfished populations of sharks the time to recover. 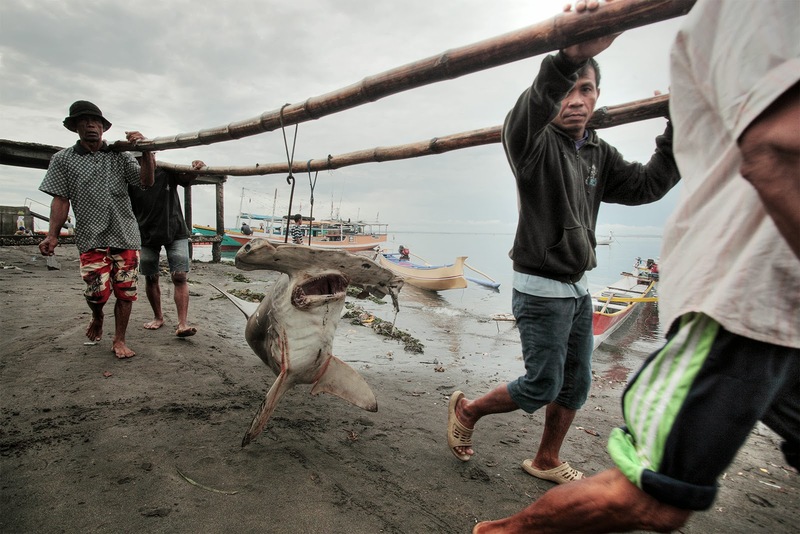 AOV: Can you explain how your study proved that hammerheads were prone to delayed mortality? And what does that mean? AG: We know that animals can suffer delayed mortality hours to days after they are released from fishing gear. But to answer this question for our sharks - including hammerheads - we had to affix satellite tags to the sharks. We showed that their reporting rates (the sharks pinging in to orbiting satellites) were significantly lower than both bulls and tigers. Tiger sharks never suffered delayed mortality - and the rates of reporting dropped in the first 2 weeks but did not change up to 4 weeks. We assume this is related to delayed post-release mortality. It is my hope that these data points contribute to the conservation of these highly sensitive-to-fishing species. As a side note, when we discovered this phenomenon happening, we actually altered our research fishing methods to give any hammerheads the best chance of survival after release - including the use of vitamins and steroid injections when they are caught. AOV: So would recommend that fishermen not target hammerheads? Is there a way for fishermen to reduce the interactions they have with hammerheads, or to target the more hardy shark species? AG: The reality is that most anglers want to catch hammerheads. 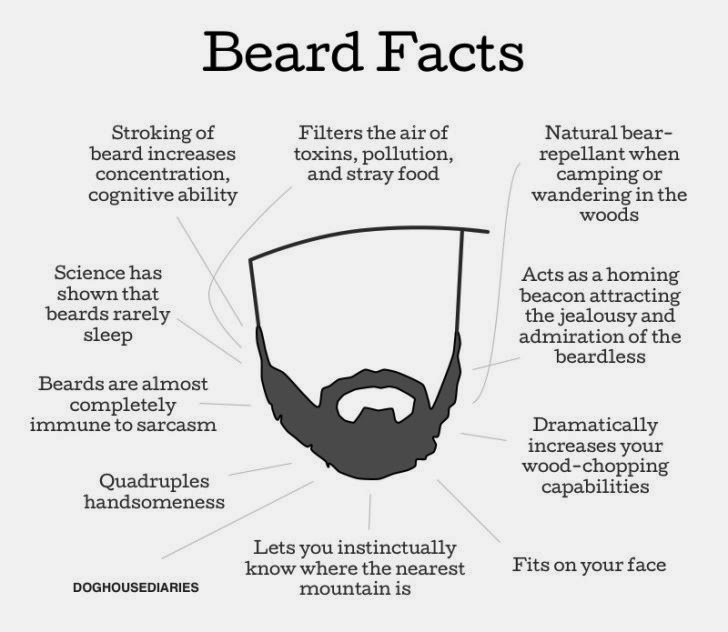 They are large, fascinating, and scary to most people. I think people will always try to target them. I think the best take home message here is that if you want that resource to exist in the future, anglers have a responsibility to act in accordance with the scientific information that now exists. If you catch a hammerhead, you need to be prepared on how you are going to release it quickly. The best practices would be to bring it in fast, keep it in the water, remove the hook swiftly or cut the line and let the animal swim away. If you use the right gear (hooks, lines), then there can be minimal impacts on the animals here and the gear will likely fall out shortly thereafter. Cutting the line quickly if the animal is fighting hard is also probably a good idea. If the State of Florida is serious about protecting hammerhead sharks from mortality in their state waters, then perhaps a species-specific policy is needed - this could range from a moratorium on catch and release for this species, to mandatory regulations on how the animal is caught. AOV: Thanks, Austin. Anything else you'd like to share? AG: You can find out more info, videos, and read the scientific publication at www.sharktagging.com. We're going to try to do a better job of getting these International Ocean Roundups posted every Friday (previously called Illegal Fishing Roundup). Here's the first one of 2014. ON JANUARY 27th the International Court of Justice (ICJ) gave its ruling in a case brought in 2008 by Peru, which claimed around 38,000 sq km of the Pacific Ocean from Chile. In the run-up to the verdict, both Peruvians and Chileans were transfixed by the issue. In a judgment that seemed arbitrary but broadly fair, the court allowed both sides to claim victory. Is whale watching with drones next big trend? Endangered fin whale is videotaped via unmanned aircraft off Southern California, raising questions and concerns about how this might affect the mammals. Michael Bloomberg’s fondness for fish is already well known thanks to the luminous tropical fish tanks that dot the offices of the billionaire’s sprawling global media empire. The former New York City mayor is about to go a step further, however, with a $53m grant from his Bloomberg Philanthropies foundation to combat the chronic overfishing some experts say is threatening the world’s fish supply. Commercial fishing’s effect on the marine ecosystem is the subject of a joint United States and New Zealand scientific expedition in the South Pacific, and it is expected to come under scrutiny. Four bodies found, search underway for the other six on board a capsized patrol boat in poor weather. The crew were all from the Russian Federal Security Service's (FSB's) border directorate for Sakhalin Region, and they were lost performing their duties. The Fijian cabinet has approved the Offshore Fisheries Management (Amendment) Decree 2014 which features higher penalties meted out to operators found engaging in illegal, unreported and unregulated (IUU) fishing. The Fiji political opposition grouping, the United Front for a Democratic Fiji says the fisheries ministry has failed to address problems in the tuna industry with urgency. Radio program. A Hong Kong-based conservation group claims a Zhejiang company is running the world's largest shark abattoir, processing hundreds of endangered specimens a year to produce health supplements and meat for restaurants. Sea Shepherd Australia reports that in the early hours of yesterday morning the fisherman hired to perform what it calls Western Australian premier Colin Barnett's dirty work of killing protected species, went out to check drum lines as part of the new shark cull program off the Western Australian Coast. Investigations are underway into an incident on a foreign fishing boat which left a fisheries observer with his left arm partially-amputated on Friday. MORE distressing footage has emerged of Japanese hunters hauling a pod of four Pacific white-sided dolphins from the ocean, as activists try to stop it. Dozens of scientists have converged on Guam to study a so-called chimney effect given off by the warm waters around the territory, and the influence it has on the global climate. The venues for the United Nations Small Island Developing States conference to be held in Samoa in September are under the watchful eyes of a UN planning team now in Apia for a week-long meeting with the government. They are meeting the Samoa government this week to look at preparations for the 2014 third international conference on Small Island Developing States, with 3,000 delegates expected to attend. The American Samoa longliner group, Tautai Fishing Association, says if federal and local government, port owners and industry members work together, its suffering industry could be saved. Recreational fishers and conservation groups have today launched a joint campaign calling on political parties to make pre-election commitments to permanently ban super trawlers from coming to the state. Authorities resumed patrolling near Odisha's Gahirmatha beach, one of world's largest turtle nesting sites, days after it was stopped following a row over the killing of a fishermen in the region, an official said Thursday. The demand for shark fin soup has been declining in recent years, according to restaurants, hotels and suppliers in Singapore, while observers say that sharks could still face extinction in the next 10 years. The United States government pledges to maintain its presence in the Pacific as part of building its friendship with island nations. British anglers and sport fishers bring more benefits to the economy, but a flawed policy alienates them completely. Negotiating teams from the European Parliament, Agriculture and Fisheries Council and European Commission reached a political deal on how to allocate €6.7 billion of subsidies to the EU fisheries industry. However, WWF says that it may undermine attempts to end over-fishing. In Spain, one in four products made with fresh or frozen tuna has been found to have been fraudulent labelling, according to a European study conducted by CSIC, the Spanish National Research Council. Scapeche, the fishing fleet owned by French retailer Intermarche, will stop deep-sea bottom trawling below 800 meters by early 2015, as part of an agreement with NGOs. On 27 January at La Plantation Hotel in Balaclava, the European Union (EU) and the United Nations Office on Drugs and Crime (UNODC) will celebrate the renewal of their partnership under the EU-funded Programme to Promote Regional Maritime Security in the Eastern and Southern Africa – Indian Ocean region, better known under its acronym MASE. Five suspected pirates arrived in Seychelles on Wednesday to be prosecuted following an unsuccessful attack in the Gulf of Aden earlier this month. The five suspects allegedly used the Dhow as a mothership to launch an attack on an oil tanker in the Gulf of Aden a day earlier. Ivory Coast is adding around 40 new vessels to its depleted navy as it confronts a growing threat from pirates in the Gulf of Guinea, the country’s defence minister said on Tuesday. CHIEF Justice Mohamed Chande Othman on Wednesday said that the Judiciary is supporting the anti-poaching campaign, dubbed Operation Tokomeza and would give special attention to all cases filed against persons allegedly linked with crimes committed during its execution. Options for suppressing piracy in the Gulf of Guinea are more constrained than policy options available off of Somalia. Nonetheless, some important short-term measures are available and need to be deployed in conjunction with determined efforts to address some of the long-term and deeply rooted causes of piracy and the lack of rule of law off the coast of West Africa. President Uhuru Kenyatta has put on notice foreign fishermen who plunder stocks in Kenyan territorial waters and drug traffickers who take advantage of the porous coastline. Uhuru said the country will no longer sit and watch as it loses about Sh10 billion annually to illegal fishing by foreigners. The ISSF has pushed back the final decision on its possible blacklisting of a vessel accused of IUU fishing. The organization says the investigation into IUU fishing allegations of a Dongwon owned vessel are still ongoing. The outcome, that was supposed to be reached at the close of 2013, is now postponed again and only expected to materialize in spring this year. Scientists are beginning to assess impact on fisheries. Animal welfare groups are calling for a boycott of NBC's telecasts of the Winter Olympics in Sochi, Russia, next month over the host nation's treatment of whales and dolphins. A lost vessel with disease-ridden rats is about to hit Britain's shores, according to reports. But how do you lose a ship... and how can you locate it again? Eagle ray killed on Saipan. The global shark news today is dominated by the shark cull in western Australia, the discovery of a whale shark processing center in China, and a new assessment by IUCN that estimates more than half of all shark and ray species are threatened or near threatened with extinction (53.9% to be exact), all of which are negative stories. We want to bring attention to something positive. 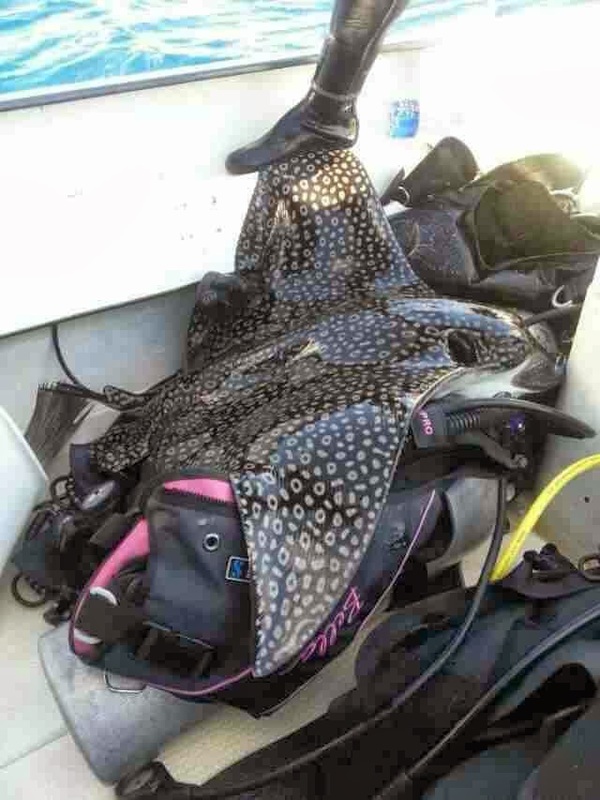 A dive operator spent a night in jail in Saipan in the Commonwalth of the Northern Mariana Islands (CNMI) for killing a spotted eagle ray. While it is too late for this individual eagle ray, this successful enforcement action creates a deterrent that will ensure other individuals are left unharmed. Spotted eagle rays are assessed as near threatened by the IUCN Red List of Endangered Species, and their populations are decreasing around the world. Congratulations to the CNMI Division of Fish & Wildlife. A Bumper Sticker and Slogan contest which will promote our local communities' awareness on the subject of SHARK conservation. 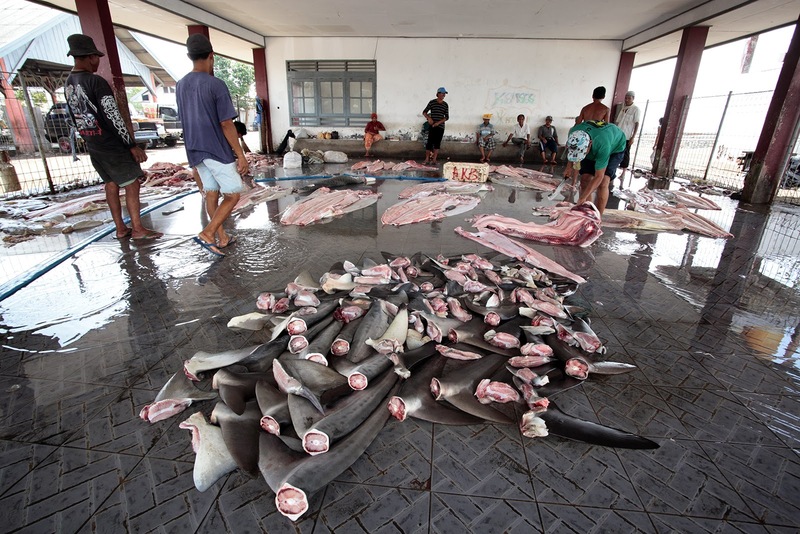 The goal for the Micronesian Regional Shark Sanctuary Project Micronesia is to protect all shark species from overfishing and trade. The objective of the Micronesian Regional Shark Sanctuary Project is to "build support for shark protection among college students and FSM citizens." The winning artist will receive a $200 cash prize. It will be tough to top my last blog about freediving with great hammerheads. I can however hope to grab your attention whilst I write about some exciting blacktip shark (Carcharhinus limbatus) fishing and how you can help do your bit for sharks, even from the comfort of your reclining armchair or the early morning train you ride to work! A team and I headed out at noon with our pack lunches full to the rim, sun cream at the ready and fishing equipment cleaned and waiting for action! So with our lines set it was, as usual, a waiting game. A few curious fish were drawn in to circle the bait and the odd stingray cruised past to have a closer look what was on offer but no sharks. Not a single shark had picked up the scent of the fabulous lunch that we’d placed on offer. Then, as were chatting away discussing various topics from food preferences to shark stories a blacktip skimmed the boat and we watched her take the bait! You couldn’t have planned it! TJ (The Manager of the Sharklab) started to reel the shark in whilst Jean and I prepared the equipment ready for the sharks ‘work up‘. Within a minute we managed to grasp a good grip of her dorsal fin and quickly but safely secured her to the boat. As usual the ‘work up’ consisted of taking a DNA sample (finger nail size) from the bottom, trailing edge of her dorsal fin, a small sample from the middle edge of her dorsal fin for stable isotope analysis, which allows scientists to investigate her diet. We also recorded her measurements which included pre-caudal, fork ,and her total length and lastly she was Casey tagged (the name for National Marine Fishery Service (NMFS) dart tags). Casey tags are used to externally mark individual sharks in the USA and The Bahamas. Once the data is recorded all scientists send the information to the NMFS allowing the data to be centralised for analysis. Within 15 minutes our blacktip shark was caught, ‘worked up’ and released. She swam away strong and the team swung a high five! In Bimini each year the Sharklab captures around 50 male and female blacktip sharks ranging from 100 to 180 cm total length. Genetic samples are then analysed by the Sharklab’s collaborators at Stony Brook University (Dr. Demian Chapman and Ph.D. Candidate Mark Bond) and preliminary findings suggest that blacktips in Bimini are more closely related to those from Cuba and the rest of The Bahamas than Florida. The deep, fast moving gulf stream between the US and The Bahamas likely acts as a barrier to gene flow preventing blacktips from Bimini crossing and vice versa. Pretty neat! Now I would like to talk a little bit about some of the BBFSF ‘Sharklab’ staff. There are SO many incredible people at the lab but I’d like to mention a few in particular. Firstly let me introduce Dr. Tristan Guttridge. Tristan is the Sharklab director, a leading shark scientist and a passionate behavioural ecologist. Tristan has released many peer reviewed papers published in top journals and he has worked alongside a variety of top shark experts. He’s regularly filmed for the likes of the BBC and well, I’m not quite sure if Tristan is scared of anything but he’s certainly not scared of sharks! Any of them! Not even the scary ones! All of us shark enthusiasts love being in the water with them, but it’s as if Tristan is one of them sometimes, you see him amongst them and for some reason it just looks so natural. Lemons, tigers, Caribbean reefs, hammerheads, or bulls...the whole lot! I can never decide if he is a total shark lover who understands body language and gestures or if he just lacks the fear gene! Either way he is incredibly talented guy and someone I had to mention! Next I would like to write about the French legend that is Jean-Sebastien Finger. Jean is a Ph.D. candidate at the Sharklab and I can honestly say he inspires me every time I’m in his presence. Imagine a guy who has a powerful beard, sorry, I mean passion for shark conservation mixed with an advanced, complex mind for science and finished off with being an approachable, honest, genuine, all round nice guy, then you can imagine Jean. Jean’s project at the Lab is focused on shark personality. He is investigating and analysing shark behaviour to show sharks do indeed have a full range of personalities. Some bold and curious as well as shy or cautious. Just like us humans, sharks are diverse and unique individuals. It’s an exciting project and I have been fortunate to assist Jean with a variety of his experiments. I could totally see Jean having his own TV series as he is a cross between a ‘mad scientist’ and ‘shark whisperer’ I just know people would be intrigued, impressed and inspired by him! The Sharklab has been conducting research for over 20 years and has one of the most respected and admired histories within the shark world. Last year alone the Sharklab contributed towards a number of ground-breaking and important projects such as the discovery that lemon sharks in The Bahamas return home to pup in the very place they were born, just like salmon and sea turtles. This scientific information is crucial for protecting their birthing habitat in the wild mangroves, especially when those particular mangroves face the pressures of a building development. 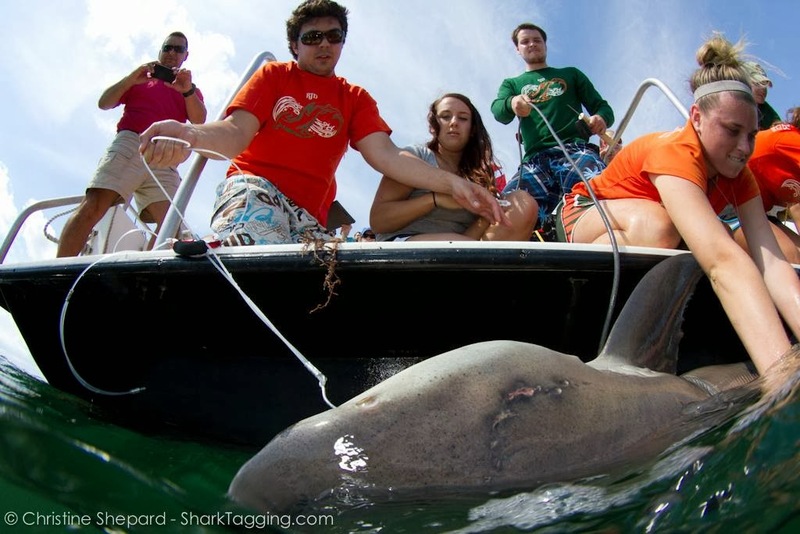 The Sharklab also initiated a project in Florida that went on to protect Jupiter’s lemon shark aggregation this year. An incredible result that has restricted the fishing season, allowing the mature lemons to receive the protection they so rightly deserve during key mating months. The Sharklab has conducted such crucial research with the help and support of volunteers and the generous contributions of donations and grants. The Sharklab is a non-profit charity meaning all donations really do make a real difference and go directly in the Sharklab's important scientific research. There really is a way for all of you to help, it just depends on you, how much time you have and how passionate you are! The Sharklab accept donations by cheque or via Paypal. Full details can be found on their website at www.biminisharklab.com/support. Another way to help would be to raise funds on their behalf. Last year I used social media including Twitter and Facebook to raise over $500 in a week, so you can do your bit from the comfort of your armchair! If you want to get out of your armchair how about doing a sponsored run? Walk? Head shave?! Anything! Still wanting inspiration? How about donating something to the Sharklab? They use everyday things such as nails, hammers, cable ties, towels, food, pencils, pens, golf carts(! ), and even boats(!). You name it and I’m sure they need it! What about you? Where do you work? Could you offer them help with your skill set? Contact the lab director and see what YOU have that they may need. The take home message is whatever you do, do something. 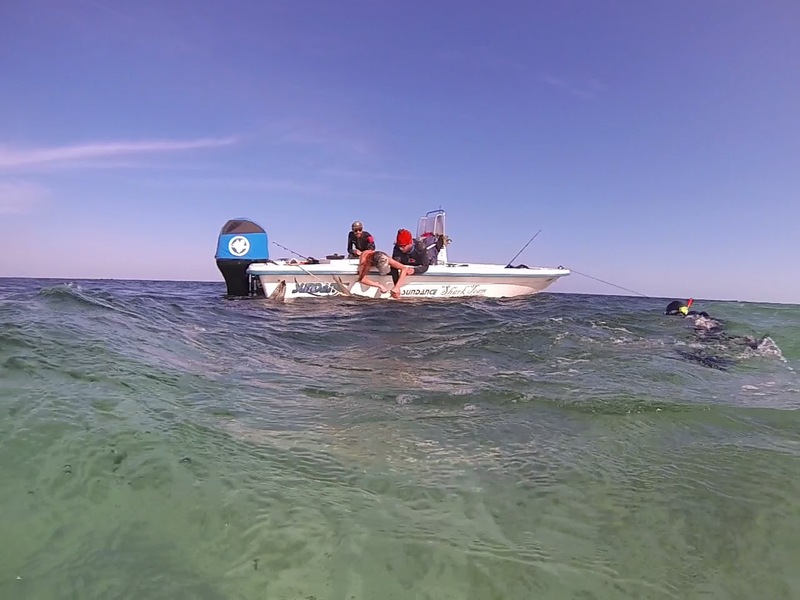 The Sharklab is a non-profit organisation so all donations, financial or otherwise are welcomed and you would be contributing towards fantastic, cutting edge research. 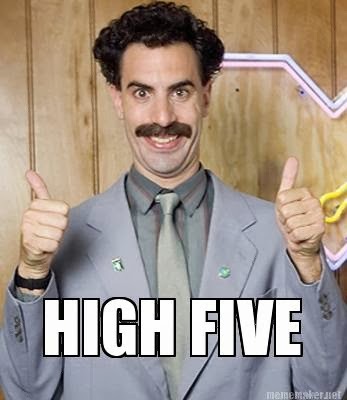 Well that’s it for another blog, I hope you enjoyed! Next time I will be blogging about my trip to Jupiter (the city in Florida, not the planet), where I helped assist the Sharklab with their annual shark tagging project! Trust me you don’t want to miss that one!